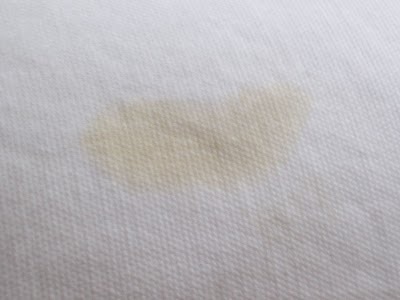 Oil seems like an impossible substance to remove, but it is possible to get out an oil stain. We’ve got some simple solutions to remove oil stains from fabric, clothes, and the floor. To remove oil stains from fabric, such as a couch or a chair, sprinkle baby powder on the stain and allow the baby powder to soak up the oil. Wait 30 minutes or so. Finally, brush the excess baby powder off the fabric with an old (but clean) toothbrush. It’s likely that you have cornstarch somewhere in your pantry and, if so, you are in luck! Use the cornstarch to pretreat the oil stained item of clothing and allow it to sit for about a 1/2 hour, then wipe the excess cornstarch off. Next, soak it with a drop of Dawn dishwashing liquid in a sink full of very hot water. Finally, spray the residual oil stain with a pre-wash spray and wash as usual. To remove oil stains from your carpet, use a clean, dry paper towel to absorb as much excess oil as possible. Next, blot the stain with a cloth soaked with rubbing alcohol. Try to avoid wiping, as it might cause the oil to spread. To remove oil stains from your driveway, blot up excess oil with dry paper towels, then spray the oil stain with hot water, squirt with Dawn dishwashing liquid, and add more hot water to create suds. Next, scrub the oil stains with a nylon bristle brush. Try to avoid letting the oil and soap solution leak into your yard, as it may damage your landscape. Wipe up the excess soap and oil with dry paper towels or old shop rags.